» A TV Series Review by Michael Shonk: T.H.E. CAT (1966-67). A TV Series Review by Michael Shonk: T.H.E. CAT (1966-67). T.H.E. CAT. NBC-TV. 26 episodes. 30 minutes. September 16,1966 through March 31, 1967. Created: Harry Julian Fink. Produced: Boris Sagal. 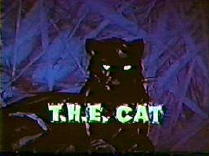 Cast: Robert Loggia (Thomas Hewitt Edward Cat), Robert Carricart (Pepe Coroza), R. G. Armstrong (Police Captain McAllister). 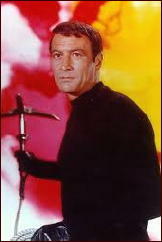 In the fifties and sixties, many television series featured a darker hero, a cool intelligent fearless man of action, and a jazz soundtrack to highlight the noir-like visual look of such a man’s world. T.H.E. Cat was among the best of such series. “Out of the night comes a man who saves lives at the risk of his own. Once, a circus performer, an aerialist who refused the net. Once, a cat burglar, a master among jewel thieves. And now, a professional bodyguard. Primitive. Savage. In love with danger. T.H.E. Cat.” (from NBC introduction that can be seen at YouTube). 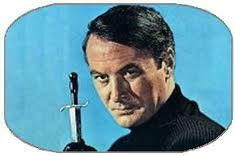 Robert Loggia was perfect as T.H.E. Cat. His looks, even the way his body moved, made Loggia the ideal choice for the circus performer turned thief turned bodyguard. 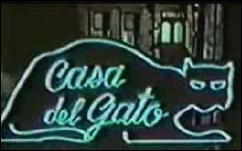 Much of the series reminds one of Peter Gunn, such as the opening titles and “Casa del Gato,” the jazz nightclub Cat owned with his gypsy friend Pepe. Lalo Schifrin’s wonderful jazz music was as valuable to T.H.E. Cat as Henry Mancini’s music was for Gunn. But T.H.E. Cat went beyond Peter Gunn. Created by Harry Julian Fink, who would later create “Dirty Harry,” T.H.E. Cat was set in a violent world full of odd exotic and often damaged people such as a dethroned King, a psychopath who refused to wear shoes, and Cat’s police contact, the one-handed Captain McAllister. Talented Boris Sagal set the look for the series as the first episode’s director and series producer. Not surprisingly, among Sagal’s many director credits include episodes of Peter Gunn and Mike Hammer (1958-1959). Another director for this series worthy of note was Jacques Tourneur (Out of the Past) who directed the episode “Ring of Anasis” (December 30, 1966). The series focused on crime over mystery, action over clues, and style over realism. T.H.E. Cat featured scenes worthy of the Bond-like hero of the time. Despite being filmed in color, the noirish feel to the series was not totally lost. The damaged characters, jazz music, violent action, creative camera angles and lighting, all made T.H.E. Cat a series worth watching then and now. Hopefully, someday the series will make it to the world of the legit DVD, and we will see it in the remastered quality T.H.E. Cat deserves. I remember this series very well. Unfortunately I was a grad student at the time, and I know I didn’t time things well enough so that I managed to see every episode. Michael’s absolutely right. This is a series that demands an official release on DVD. I have a bootleg set (not difficult to obtain) and since most episodes take place at night (or in the poorly lit confines of Casa del Gato) the colors are murky and the action on the screen is often difficult to make out. I too have the bootleg set and am in agreement with Michael and Steve about its lousy print quality. And anyone whose primary exposure to Robert Loggia was his performance as Tom Hanks’ boss (the CEO of the toy company) in BIG is in for a revelation, I think. I don’t remember THIS show, maybe was never shown over here. But Mancini and Schifrin working for TV- entertainment- just think ! We often don’t know how much we’re going to miss something until it’s gone. Way back before this one I became a fan of Loggia when he played real-life lawman Elfego Baca on Disney’s The Nine Lives of Elfegao Baca. He was also good as FBI agent Nick Mancuso (no relation to the actor of that name) on Mancuso, FBI. The Disney series was in 1958, the Mancuso in 1988. More than 50 years after he started the 81 year old Loggia is still acting. Doc, the sixties left us with some of the best TV theme music, from the American jazz of this show and many others to the British with THE AVENGERS, DEPARTMENT S and DOCTOR WHO (some claim WHO’s theme began electronic music). Jeff, Loggia has made a career out of being the perfect tough guy. Whenever you are perfect at something the audience rarely accepts you as anything else. Has he ever done anything showing a soft side? I have fond memories of this 60s show, and others like The Outsider with Darren McGavin. Electronic music began with Dr. Who? Really? Like 10 years after Forbidden Planet (where it was called ‘electronic tonalities’)? Not to forget the use of the Theremin in movies of the 40s and 1951’s The Day The Earth Stood Still. Stan- notice I said “some claim”. I rarely claim anything is the first because someone is always there to prove me wrong. I think what “some” mean is that among many electronic musicians the WHO theme started their interest in the music. Much like Gil Scott-Herron’s “The Revolution Will Not Be Televised” influenced so many musicians who turned to rap music. And as for the electronic music you cite, did we (I am 56) ever think of it as “music”? I liked the OUTSIDER too. As I reexamine television of the past I have been surprised how well 60s mysteries have held up and continued to be entertaining today. 60s TV mysteries ROCK ! The Avengers was a legendary show over here, first shown in the mid- to late 60s,when we were rarely allowed to watch it ! Emma Peel- WOW ! Ah, the Avengers. Emma Peel ruined me for mortal women. I just finished watching the Emma Peel Avengers (the set was one of the first DVDs I purchased), it was a unique show in the 60s. And I have to agree, I find myself going back to 60s TV a lot. I watched the complete Man From Uncle through Netflix, and also Danger Man (Secret Agent over here). And it was a real kick to be able to go frame by frame through some of the last episode of The Prisoner. That is not to say that I don’t really enjoy some modern British series, like New Tricks and Midsomer Murders. I have pretty much worked my way through British TV available here on DVD – the reason I originally joined Netflix, as local stores didn’t carry that kind of stuff. The style of British TV has changed though SHERLOCK and DOCTOR WHO are among the best television produced today. If you are running out of British 60’s TV series, take a look at networkdvd.com. It sells British TV DVD and has a large selection. Maybe you can find some new old series to search for on Netflix. I remain curious over SENTIMENTAL AGENT and CORRIDOR PEOPLE. I imagine that frame by frame was really helpful when watching the AVENGERS episode “A Touch of Brimstone”. So glad someone gave this series a look. I LOVED this show as a kid during the 60s. And you’re so right that Robert Loggia was perfect for this — he moved so well in the role. Likewise, Robert Culp was another performer from that era that moved with a distinct grace in his roles. I sure hope someone releases this series to disc. Thanks, Steve. I remember watching this series as a kid. I loved the custom Stingray he drove in the series. During that period of time cars were the co-stars of many a series. Honey West and her Cobra, Mrs. Peel and her Lotus Elan (largely responsible for me buying one for my first car), The Green Hornet’s Black Beauty. Talk about A Jazz theme song, Al Hirts trumpet made the Green Hornet theme my all time favorite. I admit it, T.H.E. Cat changed my life. Simple as that. Sooo… when it comes to this ‘legitimate DVD’ release business, how do we as fans and consumers force the issue? Who (specifically) do we petition and write to? Felis, you would need to write to whoever owns the copyright. It might be Paramount Studios. Sadly, every “collector to collector” version is in horrible quality. My guess the available prints would need a great deal of expensive restoring to reach the quality expected for a “legitimate DVD” release. Fans are very demanding about the quality of picture. I loved this show as a kid. Robert had swagger that is why he was perfect for the role. Hero’s back then were cool and confident. Now a days the hero’s on tv come off as Corny or yuppies trying to be cool and it doesn’t work. I sure hope the studio puts this on DVD or blu ray soon. I have the bootlegged copy and it needs clearing up real bad. The series was an NBC Production so it is possible NBC could find a market for it on Hulu or the very competitive market of download/streaming services. Hopefully Warner Archives continues to b a success and CBS selling its catalog to Amazon Prime will encourage NBC to restore such forgotten gems as T.H.E. CAT. This great series was one of my favorites and it should be restored and available on DVD and Blue-Ray. I believe the estate of Harry Julian Fink is holding this up. Why? I would have no idea. Recently met Robert Loggia at an autograph show and he looks great. Wonderful man. I sure wish some one would get the ball rolling on this one. 19. Lewis Maciocia, my guess has always been it cost too much to restore the prints. This was an NBC production so I am surprised to hear the Fink estate has any say. But TV, especially in the early years of the 50s and 60s, are known for confusing ownership of copyright. Oh, keep a eye out here at Mystery*File.com/blog I am working on a post where I use T.H.E. CAT episodes (on YouTube at the moment) as examples. Years ago, I read that there are no negatives in existence for this series, T.H.E. Cat, so there will not ever be a “restored” version for DVD (or Blu-Ray) release. Apparently the negatives were accidentally lost, or destroyed, on the Paramount lot in the ’70’s as storage problems became an issue at that studio. The prints available are of such poor quality because they are actually primitive, second generation videotape recordings made by a video engineer in Canada who was involved in broadcasting the series reruns locally back in the day. Also, I am somewhat suspicious of the “color” episode, the original pilot, “To Kill a Priest”. “To Kill a Priest” is more likely a poorly executed attempt to “colorize” the print. Is there any indication in that episode’s filmed credits that mentions the color studio, such as Technicolor? I watched this series from the beginning, in 1966, and it was always B & W. I was only became aware of this one “color” episode much later, in the ’90’s. Not all local TV stations could broadcast in color. They may have filmed with color but aired in many places in black and white. Or they could have dislike episode one color and turned to black and white but were contracted to keep color consultant credit on all series. One can only hope that somewhere in the world is some TV station that still has its print in storage. This happened to Doctor Who when they found prints for two episodes in an African TV station. I couldn’t wait to watch this show each week. It was a forerunner of Star Trek in that the chemical mix of casting, characterization, story line and music – all nearly perfect. I was struck by the music during a scene. The next day I called the TV station. A young lady listened to me hum the tune, searched the sound track and came up with Rimsky-Korsakov’s Scheherazade. I played it on YouTube tonight, thought of the scene in T.H.E. Cat and wrote this note. The scene involved Cat, hired to protect a woman from a stalker, is drugged, and struggles on the floor as he watches her being strangled to death. T.H.E. Cat was before his time. Glad I was there. Thanks for sharing Sally. One of the best parts of the comments section here is hearing the personal stories of TV viewers such as yourself. I don’t remember seeing this series when it was originally on but I am thankful I got to see it now. I wish I could see it in a proper remastered state. Where can I get a full length copy of the theme song? I have been looking for a copy of the theme song for a long time. I don’t believe it was ever released to record. Composer Schifrin does have a song called The Cat but it is a different song. He does have an official website if you want to check there. Go luck and let me know if you find it.